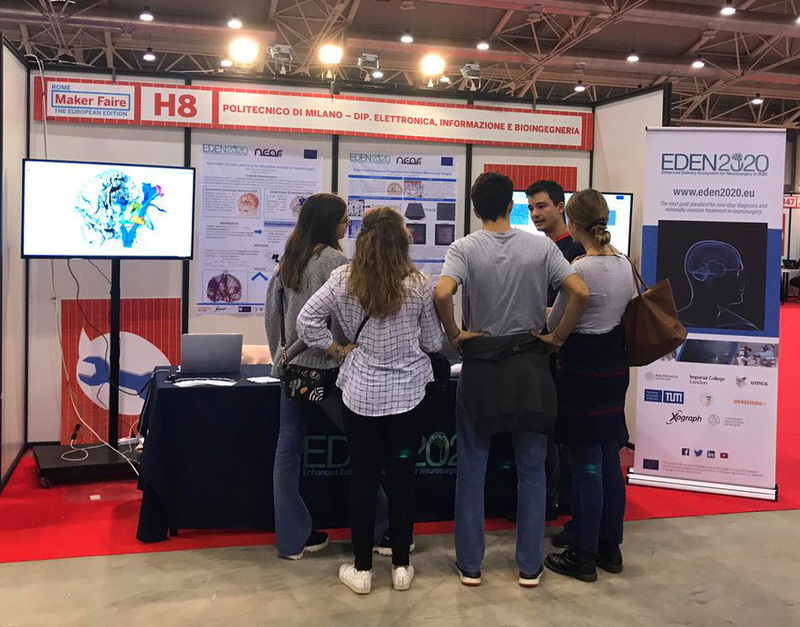 The EDEN2020 team from Politecnico di Milano had the great opportunity to showcase EDEN2020 in two events; Maker Faire Rome and Meet me Tonight in Milan. Maker Faire Rome took place over three days from 12-14 October 2018 and welcomed more than 10,000 curious visitors from all ages, background and scientific cultures. With the Faire’s ethos immersed in celebrating new developments in science, science fiction, technology, entertainment and business to solve world problems, big and small, EDEN2020 was of interest to many of the visitors over the three-day Faire. Alice Segato and Marco Vidotto (pictured) held a booth for the full three days and on the 14th, Professor Giancarlo Ferrigno gave his talk titled “Robots: With, Within And Among Us”. Alice and Marco said audiences were enthusiastic about the positive health and medical implications of the project and showed real interest in the advances in robotic and neurosurgical technology. Several medical doctors even brainstormed other possible clinical applications and its further reach. Both Marco and Alice had a fantastic time connecting with people and engaging in meaningful dialogue. 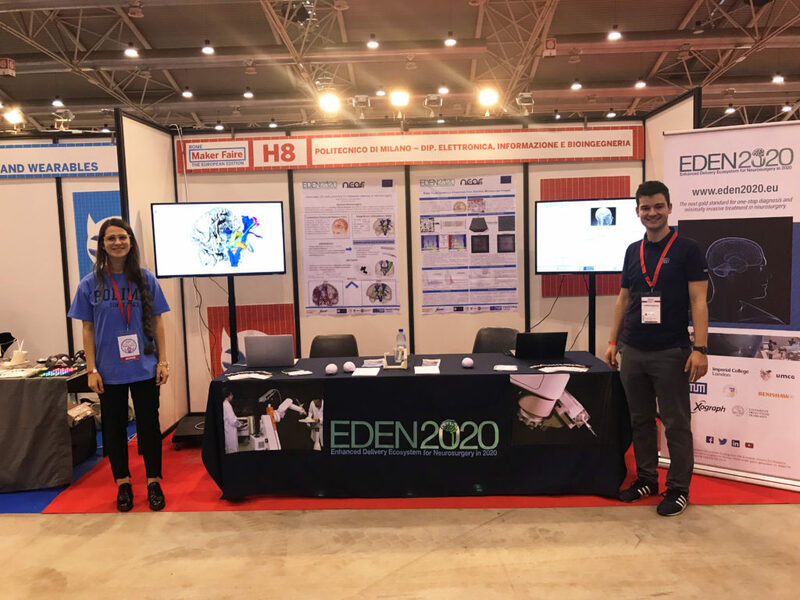 The event was great exposure for EDEN2020 with visitors learning about the importance of EDEN2020 and celebrating its innovation. 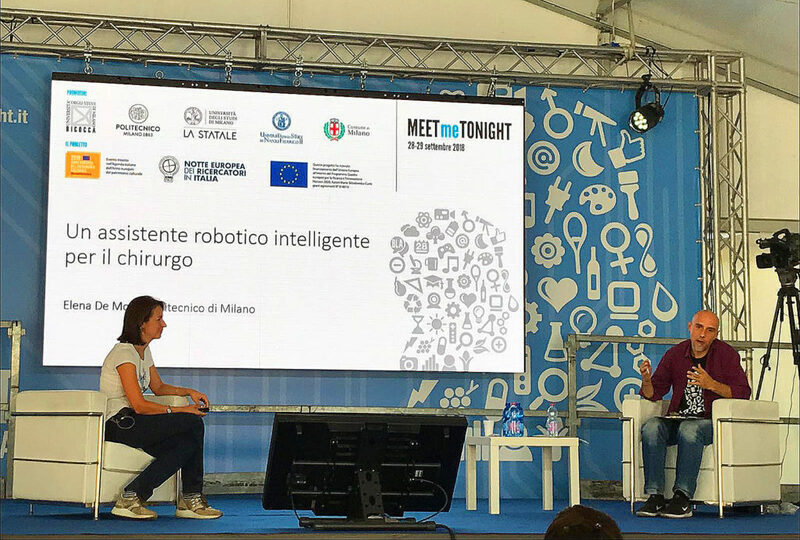 In September of 2018, Elena de Momi of Politecnico di Milano [pictured left] participated in the Meet me Tonight event. Elena engaged audiences with her talk titled, “Un assistente robotico intelligente per il chirurgo” (A smart assistant for the surgeon). Promoted by the European Commission, Meet me Tonight is an integral part of the European Researchers’ Night which is a Europe-wide public event dedicated to popular science and fun learning. It takes place each year in September with around 30 countries and over 300 cities involved. In 2015, the event celebrated its 10th anniversary and in 2017 alone, about 1.1 million people and over 21, 000 participated.